Drums, they can either be awesome and grooving or just plain loud and annoying. We want you to sound awesome and grooving and so do your friends and family. Our drum instructors take some of the misconceptions of drumming and bring you back into a realm of musicality while still keeping that rock star drummer appeal in tact. Focusing on proper technique to prevent injuries while enabling a higher level of freedom to perform everything from a soft rock beat to a massive drum solo. You want to not only look good playing, but sound good too! Drumming is generally the backbone to all music with other instruments relying on the drummer to keep an accurate time and feel. Therefore, rhythm studies among many other aspects of music is a vital area of focus for all drum and percussion students. 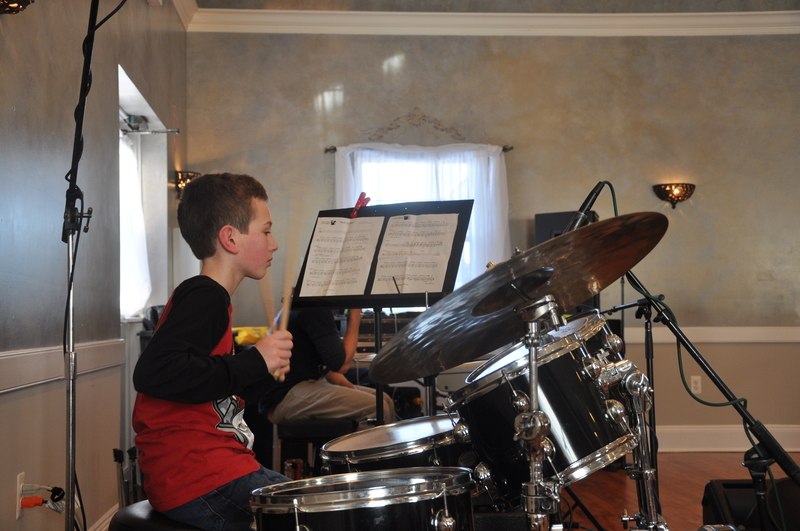 We cover all the essential drum beats and fills in preparation to play your favorite songs. We touch on many genres of music from rock, pop, metal, funk, jazz, blues and more to ensure your drumming is well rounded and pulls inspiration from multiple sources. And of course, we cover your specific interests along the way. We have various curriculums well suited for the absolute beginner from a young child through an adult and more advanced curriculums for players seeking to play with bands or audition to colleges. We can teach not only teach drum set, but also snare drum performance and rudiment work for a focus in marching percussion or symphonic band percussion.